Pianist Janice Fehlauer was the gold medalist of the Wideman International Piano Competition and the winner of the University of North Texas Concerto Competition, and won second prize in the Los Angeles International Liszt Competition and the Hodges Competition for 20th-Century Music. She has appeared as a concerto soloist in the USA with the Mississippi, North Florida, Meridian, Lewisville, Clear Lake, Baytown, and UNT symphony orchestras, and in Canada with the Fraser Valley and Chilliwack Metropolitan orchestras. Janice has also performed solo recitals for the Philips Gallery in Washington, D.C. and the Dame Myra Hess Memorial Concerts Series in Chicago. She recently completed a solo recital tour of England and Scotland, including a performance at the Edinburgh Fringe Festival. 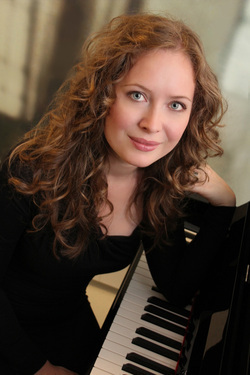 In addition to her solo performances, Janice is a sought-after collaborative pianist who was on the staff of the American Institute of Musical Studies in Austria for two summers. She served at The Dallas Opera as repetiteur and as assistant to the chorus master, and has also played and coached for Houston Grand Opera’s educational programs, Fort Worth Opera, UNT Opera Theater, Moores Opera Center, and the Houston Symphony Chorus. Janice began her musical training in her hometown in British Columbia, where she received the Associate Diploma from the Royal Conservatory of Music in both piano and violin. She holds a bachelors degree from the University of British Columbia, a masters degree from the University of North Texas, and a doctoral degree from the University of Houston. For more information please visit www.janicefehlauer.com.